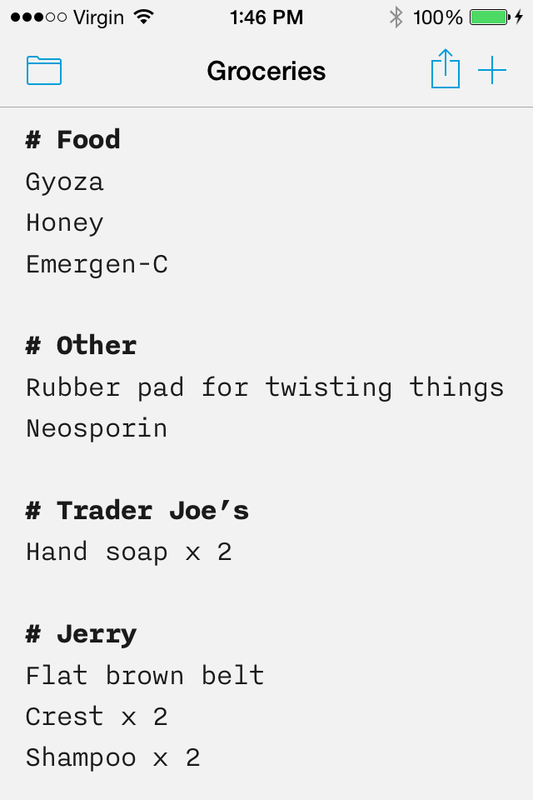 Because ia Writer is available on Mac and iOS, and uses iCloud to sync, it is great for simple lists such as shopping lists. Most of my non-fiction writing nowadays is in ia Writer.1 I first picked up ia Writer on the iPad because I needed a good program for writing blog posts on the fly. Because the same app worked on both the iPad and the iPhone, I ended up using it for simple lists, such as my grocery list. It uses iCloud to seamlessly synchronize between the two devices, as long as I come near a WiFi network on the iPad. Which, increasingly, is not a problem. When I saw that there was a Mac OS version of ia Writer, I immediately picked that up, too; it means that I can switch immediately from iPad to iMac for serious writing, and for quick changes use the iPhone on the run. I use ia Writer on Mac OS probably more than any other app; I’m writing this review in it, for example. When I’m done, ia Writer on iOS can export to HTML, PDF, and “formatted text” for pasting into other apps. Of course, as a Markdown app the text can be copied exactly into Editorial or any other Markdown app. And of course ia Writer on Mac OS can export to PDF just like any other app; and it can copy to HTML, which I will use to paste this into my blog software. Combined with ThisService, ia Writer on the Mac is a great part of my writing workflow. What keeps me using ia Writer, besides its presence on all three of my devices, is that it is designed around writing. This is especially obvious when using the iPad’s built-in keyboard. It features a bar on the top that contains automatic smart quotes and automatic parentheses. It also puts the dash, asterisk, and pound front-and-center for use in Markdown, characters normally hidden behind going to numbers and then going from numbers to special characters on the default iOS keyboard. The custom keyboard bar is one of ia Writer’s standout features. I have found iCloud and ia Writer to be much more reliable than Dropbox on Editorial for synchronizing documents between devices, especially with the iMac. The only times I have iCloud synchronization conflicts is when I edit on the iPhone and iPad in areas without any network access; since I’m too cheap to buy network access on the iPad, the iPad has no means to synchronize, so that’s really my fault. But I’m having to look at Dropbox conflicts (with Taskpaper files, mainly, now that Editorial supports Taskpaper) about once a week. However, ia Writer does also have Dropbox support, which makes it easy to open files from other Markdown apps such as Editorial. Information Architects also sell an app called Writer Pro. I don’t think Writer Pro is the pro version of ia Writer. It appears to be a very different beast solving very different problems. However, I have not used Writer Pro and am going only off of their advertisements. There was some worry among ia Writer users after Writer Pro was announced that ia Writer would wither, but since then there have been updates, including a significant update to ia Writer’s live Markdown display. As I write this, ia Writer for Mac appears to be 50% off until they come out with the 2.0 version, which they claim will be a free upgrade. That release is “imminent”, but it’s been imminent for a few weeks now. Once that release comes out there will probably be a price increase. Update, September 14, 2015: They have renamed iA Writer Pro to iA Writer, and removed iA Writer (which they refer to now as “classic” on their web site). That is, what they’re currently calling iA Writer is the more complex version not reviewed here, both on iOS and Mac OS. In response to Must-have iOS apps: Apps for the iPhone and iPad that make doing things incredibly easier. For fiction, I use Nisus Writer Pro—often after spitballing in ia Writer. Editorial stands out among Markdown editors by being far more flexible and at the same time easier to use. Write services using standard command-line scripting languages: Perl, Python, and more. This is a simple app that fills a surprising gap in Photo apps: it allows resizing and compressing images with automatic recalculation of file size. The Inkpad app makes it easy to not only create vector (SVG) graphics on the iPad, but also to add them to existing photographs. 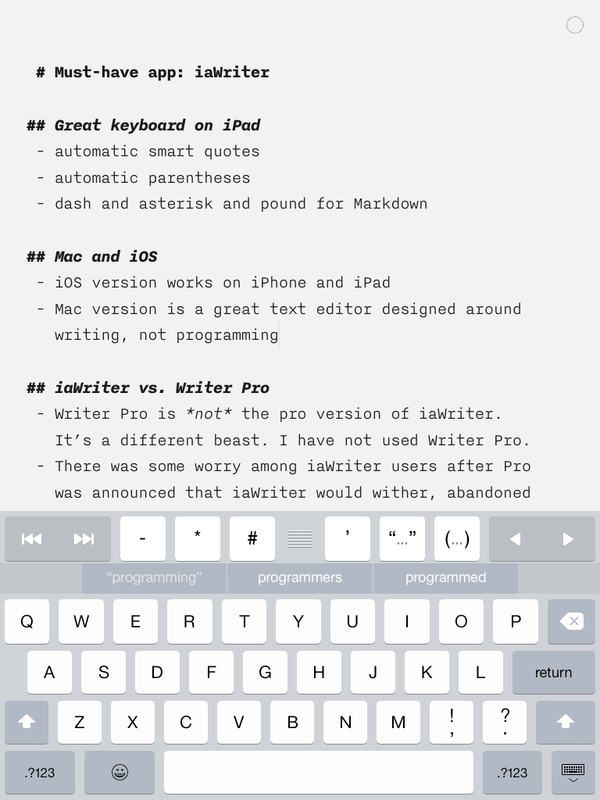 ia Writer for iOS and Mac OS last modified September 14th, 2015.